Dennis Schroder scored all of his 19 points in the second half to help the Oklahoma City Thunder beat the San Antonio Spurs 122-112 on Saturday night. 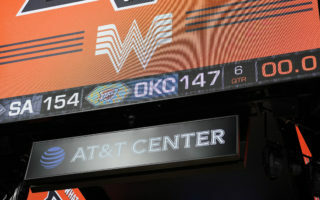 LaMarcus Aldridge scored a career-high 56 points and the San Antonio Spurs overcame Russell Westbrook’s triple-double with 24 points, 24 rebounds and 13 assists and outlasted the Oklahoma City Thunder for a 154-147 victory in double-overtime on Thursday night. Quarter-by-quarter pricing has launched on NBA League Pass, allowing fans to purchase games at reduced costs after each period.